Set off the look of your kitchen counter, pub table or family bar with a set of our stunning Amish Corbin Parsons Bar Stools. Shown here in Brown Maple wood, with a Rich Tobacco stain and Linen fabric, these Parson Chair style bar stools create an inviting ambiance. Comfort, quality and the skills of Amish craftsmen are displayed in the construction of these stools. At DutchCrafters, we love involving you in the design process to ensure that we bring your vision to life! The Amish Corbin Bar Stool displays a generous, cushy seat supported by slender legs that you can choose fabric or leather upholstery for. The seat edge is lined with your choice of decorative nail head to add a distinct design. 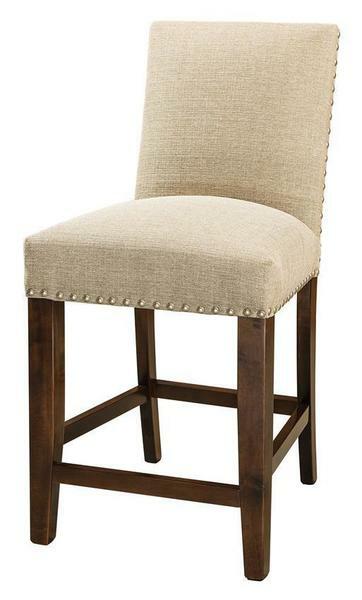 Dimensions: Depth: 18" Width: 20" Seat Height: 24" or 30"
Consider our Amish Baldwin Swivel Bar Stool for another option. Be sure to visit our blog for more information on dining room styles. Back Height from Seat: 17"
Seat Height: 24" or 30"
Quality Takes Time – Typical Build Time for This Piece is 6 to 8 weeks.